Home Depot had a free Kid's Workshop on 6/4 to make a Father's Day Trophy Phone Holder. If you missed it, check with the store since they often sell their kits or sometimes have left-overs. Zoo: Many zoo's are offering Dads free admission. First Watch: Free small bag of coffee (with meal purchase). Outback: Not free, but frequently offers coupons online. Barnes & Noble: Father's Day storytime 6/16 at 11:00. 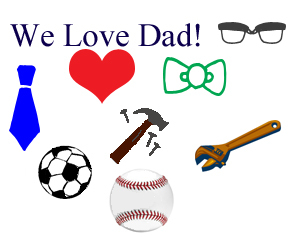 If you know of any other freebies for Dad, please share in Comments!